When I read Lindy from Toast proposing a blogging event titled, to make something from nothing, I was intrigued. Having finished school not so long ago, I definitely understood financial constraints. I have enjoyed fine dining when I have been able to afford it; however, I have found solace in foods that are tasty, cheap, cheerful and comforting. So, I appreciated Lindy’s concept of putting together a collection of recipes that are enjoyable, affordable, and creative and was up for the challenge of trying to make fantastic eats for little money! I decided not to buy any ingredients and instead used what was in my kitchen. I had 3 pears sitting in my fruit bowl; so poached pears it was! This recipe is simple, cost effective, and good for any occasion. 4 pears, peeled and cored. You can cut the pears in half to core them. Or, you can use a whole pear and dig out the core from the blossom end with a melon baller or apple corer, leaving the pear in tact. The latter method works best when poaching pears. Add all the ingredients into a small pot and bring to a boil. Take off the stove, and let sit for 10 minutes or until semi-cool. Add peeled and cored pears to the poaching liquid and simmer with a piece of parchment paper over top of the pears, so that no oxidization occurs. Poach pears for 20 – 30 minutes or until tender and soft to touch. Take off the heat, and let sit for another 10 – 15 minutes before removing pears. Serve pears once they have cooled, or leave the pears in the fridge soaking in the poaching liquid, tightly covered, until needed or for up to two days. If you would like to make a granitè with the remaining poaching liquid, sieve out the spices, and pour liquid into a flat shallow container to cool. Freeze, covered, until frozen. Use a fork to scrape the ice into small shards. Transfer the granitè to a plastic container and keep frozen until ready to use. If you don’t want the granitè to melt too quickly, try chilling your glasses or bowls in the freezer. 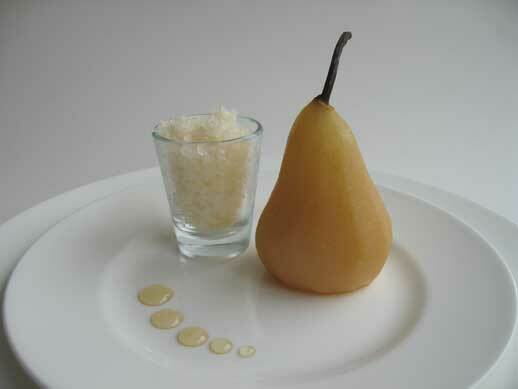 Then, serve a lovely poached pear with the granitè. Whether it is a casual or fancy affair, poached pears are always simple and elegant. *Note: If you have some leftover wine, substitute half the water in the poaching liquid for wine. You’ll then have poached pears in wine with a wine granitè – yum. Posted by Sam at 10:57 p.m. There is such beauty in simplicity! Lovely photo, Sam! And the pears sound wonderful. Thanks for your comment. I've added you to my blog roll. Thanks for all your comments! I appreciate your encouragement and feedback. Thanks for visting. I enjoyed your soup post as well. Lovely, Sam! How clever (and delicious) to use the poaching liquid for a granita! Sam, making a granita from the poaching liquid is such a good idea. We made poached pears for Sugar High Friday a couple of months ago, and we had a lot of poaching liquid that went unused. This would have been such a great way to use it. Thanks for your comment. It seems like such a waste not to use the poaching liquid, especially when it has the right ratios for a granita. Your recipe and the picture inspired me while surfing for poached pears recipes. I'm making the dish to serve with an extraordinary dessert wine for an important family reunion and birthday dinner April 28th. Please don't be upset that I captured your 'something from nothing' driven dish for a lavish meal...we are definitely more in your vein than extravigant; this is a specal occasion. I'll send you a photo after the event. This is by far the best poached pear recipe I've ever come across, and tasted! Just awesome. This will definitely be my dessert of choice from here on it. THANK YOU SAM! Try a heaping tablespoon of instant coffee in the liquor. Different and delicious.